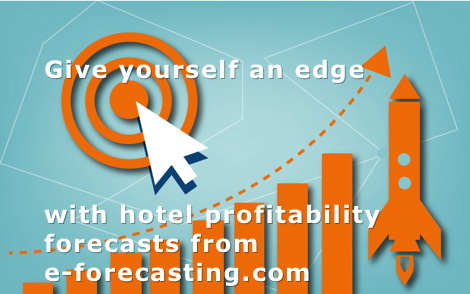 e−forecasting.com&apos;s HIL, a composite of nine predictive analytics which gauge what&apos;s next for U.S. hoteliers, increased by 0.2% in June to 138.7, following an increase of 0.2% in May. A measure of future business activity in U.S. hotels rose in June according to the highlights in the latest issue of the Hotel Industry Leading (HIL) Digest. e−forecasting.com&apos;s HIL, a composite of nine predictive analytics which gauge what&apos;s next for U.S. hoteliers, increased by 0.2% in June to 138.7, following an increase of 0.2% in May. The index is set to equal 100 in 2010.
" said Evangelos Otto Simos, Digest&apos;s editor and professor at the University of New Hampshire. The probability for the hotel industry entering a recession in the next six to nine months, which is detected in real-time from HIL with the help of sophisticated statistical techniques, registered 6.1% in June, up from 5.4% in May. 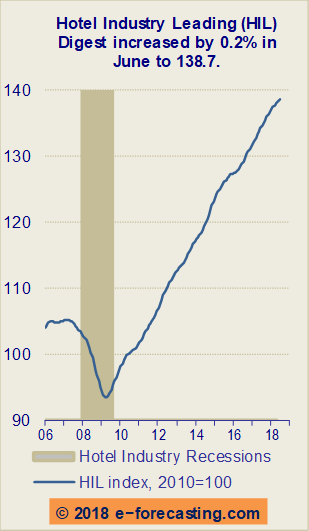 When this predictive analytic passes the threshold probability of 50% for more than three months, the U.S. hotel industry will enter a recession phase in its business cycle in about six months later.